Today is the opening day of Papa’s Donuteria! As expected, the new restaurant is full of customers, one by one are waiting for service. Can you get all your order and serve all your customers in the shortest time? You will definitely make a lot of money if all of your customers are satisfied. 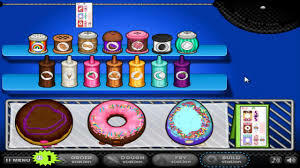 How to play Papa’s Donuteria? You’ve completed basic traning in Papa’s Dounuteria! Try this next order on your own! You must make 4 ways: order station, dough staton, fry station and build station. Your mission is to make Papa’s Donuteria pie according to customer orders.Use Mouse to perform in-game actions.